My inspiration this week is Meryl Streep and her FB post! Considered by many critics to be the greatest living actress, Meryl Streep has been nominated for the Academy Award an astonishing 19 times, and has won it three times. She is one of only six actors to have won three or more competitive Academy Awards for acting. However, her journey to the top was not easy! He has received a lot of rejections, but she never gave up on her dream! 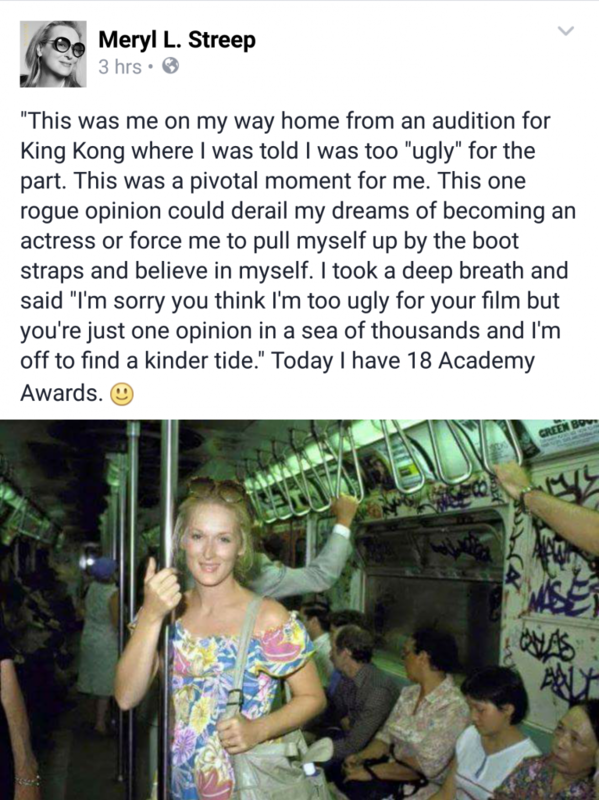 As you can see on her post above, she was even told she is ”too ugly” for a part in the King Kong movie. Meryl had to beg and battle for a chance to perform her two greatest roles, but nothing ever stopped her. Being confident in yourself, your skills and your talent is the key to success! Never give up on your dreams, even if people tell you, you are not good enough! Be passionate and work hard for what you want, and eventually you will get it! If Meryl Streep has listened to the King Kong producer and gave up on her dream, she would have never became such a prominent actress!